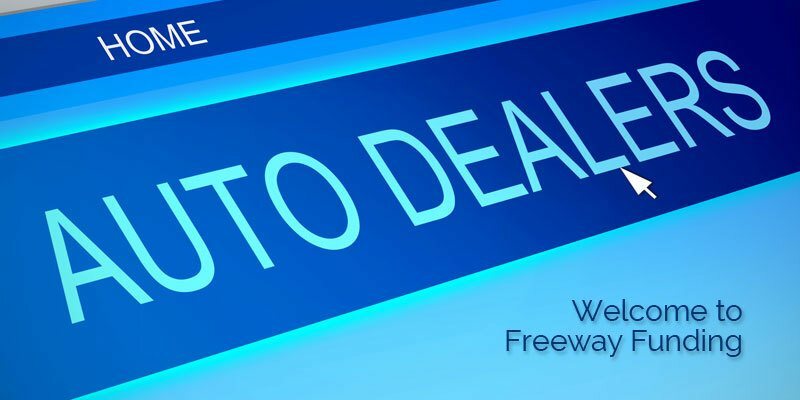 Dealers Access to Services from Freeway Funding, Inc.
Freeway Funding is a consumer finance company specializing in subprime automobile vehicle financing. We provide flexible programs and unparalleled support to help grow your business. Unlike some of our larger competitors, who automate all their loan decisions in a rigid, formulaic manner, we work with our dealers to devise solutions that benefit dealer, borrower and Freeway alike. RouteOne or our DecisionLender4 portal. If you would like more information about working with Freeway Funding, please click HERE to contact our corporate office or call (805) 288-5686. To apply to become a dealer for Freeway Funding, click HERE to complete our Dealer Application Form. For a detailed outline of the dealer enrollment process, click HERE.